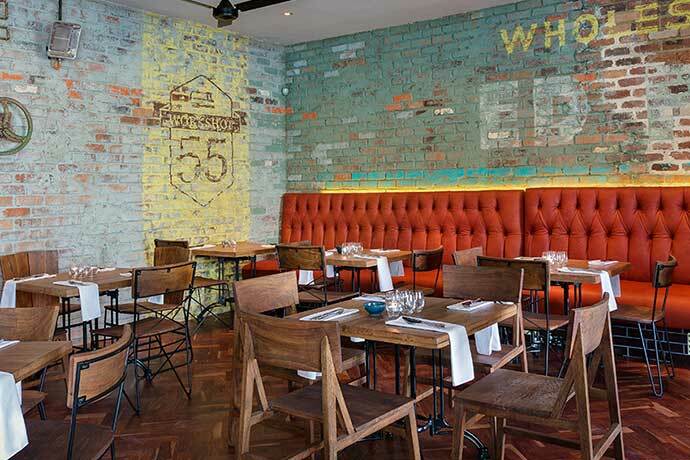 Workshop 55 bar-come-eatery is the newest hot spot in Johannesburg! It’s clear that the vibey bar-come-eatery that is Workshop 55 is one of the places to be seen in the ever-popular Parks area. Located on 7th Avenue, much of the old-world vintage charm of the original property has been beautifully integrated into the industrial feel of the restaurant. And, it’s fast becoming renowned for artisanal infused G&Ts (think rosemary, strawberries and cardamom) and a modern tapas-style menu. For a R180 entrance fee, you can select three tasting bowls from the menu. I went for the pasteis de queijo (a decadent Gruyère tart with caramelised onion and balsamic compote) before moving on to the gravadlax prepared with gin, fennel, lime and salt served on a potato rösti, and the more traditional beef trinchado. If you’re still hungry, there are also six speciality dishes to sample. For dessert, the pineapple with fennel and lime sorbet is a refreshing choice, while the lemon-curd tart is a sweet, creamy treat. Open from Tuesday to Saturday from 4pm for drinks, with dinner being served from 6pm. 55 7th Avenue, Parktown North; 011-442-6252; workshop55.co.za.